The team are back and in their sights this episode – Souls Ark – a Doctor Who spin-off style film so bad the director took his name off it. This has to be good. Footloose 2011 is also watched/endured – depending on whether you side with Rolph or Andu. The team report on their efforts to make Daquiris and get a thrilling insight into the domestic arrangements of one half of the team. 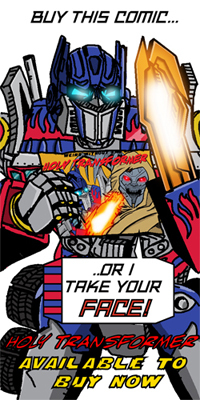 Rounding things out we look at at the fanzine – Transformers: RetroGeneration One produced for the Birmingham Informal Gathering 4.